To get intense color using your aqua painters try rubbing alcohol. I read about this on SCS and was anxious to try it. I love how intense the color is. To colour in the flower from the One of a Kind stamp set I filled my aqua painter with rubbing alcohol and used my red riding hood reinker to dip into and pick up color. 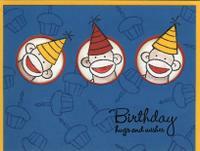 The card stock colours are Kiwi, Sahara and Riding Hood Red. 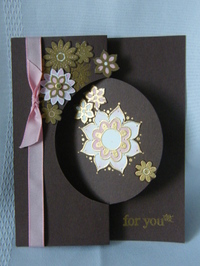 In the center of my flower I used Tombow and Dazzling Diamonds. 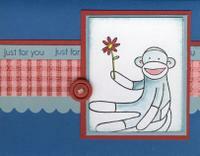 Here's another card using the sock monkey set. 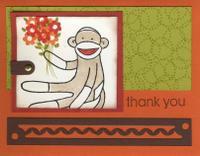 I love Stampin' Up's new scallop punch now that I have the hang of lining it up. I cut a 3/4" strip of cardstock and put a vertical pencil mark on the back. If I want to make ric-rac I centre the pencil mark in the grove of the scallop when I punch one edge and in the centre of the scallop when I punch the opposite edge. 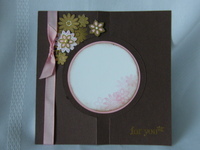 This also works to make pearl necklaces with Stampin' Ups shimmery white paper. except line up both sides with your pencil mark in the groove. 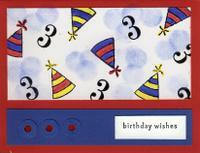 If you don't punch right to the end you'll get some interesting borders like the chocolate chip one I used on my card. Only 18 more sleeps until the new catty! Use your favorite Designer Series Paper to create these projects. I've compiled the tutorials for 8 of my original projects. Each project can be completed in 10 minutes or less. All of the tutorials for these projects come with complete instructions and full colour photos. 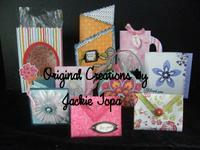 So order your 11 page file and your favorite Designer Series Paper and get started making these gifts. Instructions are sent via email usually within 24 hours of receiving your order. Please note that the Designer Series Paper used in my tutorials is now retired but these projects can be made with the designer series paper of your choice. This little guy is starting to grow on me. I wanted to try some of the new in colours. I used Paciffic, Riding Hood Red and Summer Sun. 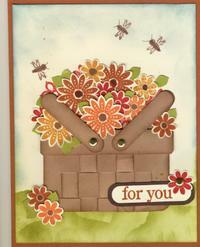 Well I started out making another sock monkey card so I'm not sure how I ended up with a basket of flowers. I'll post the details tomorrow. My new stuff came yesterday . I snuck away this morning to make a card before all of my house guests woke up. I can't wait to play some more. 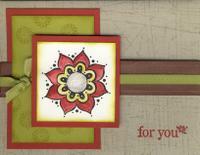 Looking at new Stampin' Up products put me in the mood for card making so I made a couple of swing cards. You can find the tutorial on Split Coast. I used my colozzle to make my centre.